City Council’s proposed legislation to allow camping in Seattle Parks must be stopped. There are few human activities that will impact an urban forest as much as camping. This recent camp in Magnuson Park was in place less than a month, and now the carefully-restored forest habitat has been severely impacted. Ten years of ecological restoration by dedicated volunteers was ruined. Do we really have to explain to the Council why this is not okay? Apparently so, because there has been little public discussion of the ecological effects of their plan on Seattle’s remnant forests—most of which are within the park system. Forest ecology is delicate and restoration takes a lot of time and effort. And it can be ruined in a few short weeks of high-impact use. The Green Seattle Partnership was set up to foster community, deepen our connection to nature, and to restore 2500 acres of forest habitat by 2025. We’re over halfway there…and now this. These forests were preserved for their ecological value, environmental education and low-impact recreation. This ordinance would take a public natural resource—part of our natural heritage—and use it for a completely new purpose. Tell them that it is wrong to pit two worthy causes—nature preservation and homeless advocacy—in opposition to one another. We DO want homeless people to get the help they need. We DO want more housing and shelters for homeless people. We should all be more compassionate and more sensitive to the needs of people experiencing homelessness. We DO NOT oppose safe and sanitary places for camping—if there are not enough options to house people indoors. If public land is needed for encampments, it must be in defined areas that can withstand the impact. Don’t use forests. Don’t use parks. Council may be voting on Friday, October 14th. This could become law in 2 days, so write, call, or go to the Council meeting and make your voice heard. (See update at bottom). Reporting on the ordinance in the West Seattle Blog, your best source of information. Read the statement by Forterra, the non-profit organization that works with the Green Seattle Partnership. Friday, October 14, 2016, 9:30 a.m.
For more information on the Council Meeting click here. Please reject the proposed homeless encampment ordinance. Seattle’s park forests and natural areas must be protected against high-impact use. Our forests are not unused spaces, their value lies in the fact they are Seattle’s last remnants of our natural heritage. We must preserve, protect, and improve them so they will be intact for future generations of people and wildlife. We also need to work on helping people of all ages and backgrounds access them, connect with the nature in meaningful ways, and learn to appreciate their true value. Nature—especially urban nature—is vital for human health and happiness. 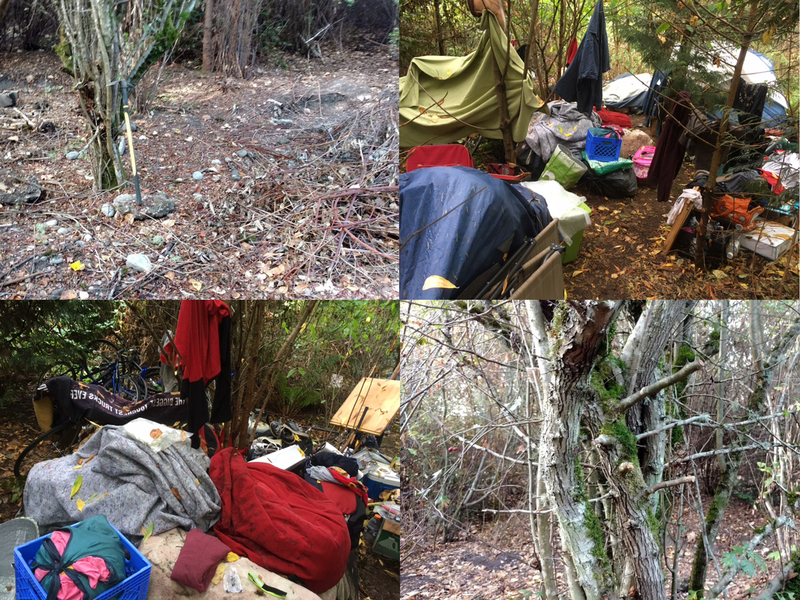 Please do not make our forests “suitable” places for encampments, which would have a very great impact on urban forests and their role in urban life. As a city, we should have more compassion for people experiencing homelessness, and should do much more to help solve the crisis. But if forests are deemed “suitable”, the Council would be putting two worthy causes—nature preservation and homeless advocacy—in opposition to one another, and that is wrong. If public land is needed for encampments, the City should select defined areas that would be able to withstand high-impact use. City leaders should solve the housing crisis without using our forests. *Do not be confused by the language in the ordinance. In its present form, it states that no camping would be allowed in natural areas “that have already been restored or that are actively being restored”. This is unacceptable. Apparently, the Council has no clue how these forests are in reality. Have they ever been in one? It is impossible for most people to tell whether a forest has been restored in the past. Are they expecting that homeless people will carry a Green Seattle Partnership Map with them? (If you want to see for yourself how complicated it is, check out the map). And most important, the Council is blind to the fact that some of the yet-unrestored places have some of the best remaining habitat. That is why they were left to last. If they are ruined, it will be native forest habitat that will gone forever. The ordinance also would allow camping in wooded places “along the edges” of regular parks like Woodland Park. This means that any wooded patch in parks like Lincoln, Seward, or other neighborhood and regional parks could have camping. Virtually all parks have wooded places. UPDATE: October 15, 2016. Council met yesterday to hear public opinion. No consensus was reached. They are still in discussion. Read the reporting from the Seattle Times. Thank you, Denise. I just wrote to the council members regarding this ill-advised proposal. Already contacted the council members. Not a good idea.